South Africa will field the same starting 15 and the same bench as they did for their 38-12 humbling of Australia in Brisbane last weekend. Coach Heyneke Meyer says the Springboks will need to go up a gear when they face the All Blacks in a top-of-the-table Rugby Championship clash in Auckland on Saturday. Meyer says it’s a great position to be in to be able to name an unchanged squad, but adds that he has utmost respect for the All Blacks. “You don’t want to get into the situation where it’s easy to pick the same side and everything goes well and you’ve won,” he said. Meyer said some of his players had the flu but he expected they would all be over it by match day. Both South Africa and defending champions New Zealand have won their first three matches of the tournament, but the Springboks lead the table because they have an extra bonus point. New Zealand will name their team on Thursday morning. 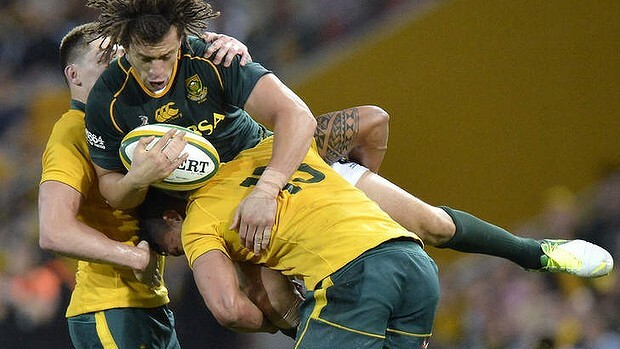 South Africa: Zane Kirchner, Willie le Roux, JJ Engelbrecht, Jean de Villiers (captain), Bryan Habana, Morne Steyn, Ruan Pienaar, Duane Vermeulen, Willem Alberts, Francois Louw, Flip van der Merwe, Eben Etzebeth, Jannie du Plessis, Bismarck du Plessis, Tendai Mtawarira. Reserves: Adriaan Strauss, Gurthro Steenkamp, Coenie Oosthuizen, Juandre Kruger, Siya Kolisi, Jano Vermaak, Pat Lambie, Jan Serfontein. I had earlier called for SA to win by 4. I am now changing that to a 9 point winning margin. I continue to flaunt my unbeaten call for the entire TRC at the end of which it will be apparent that Messerschmitt Willie’s impact on the SA team is indistinguishable from the impact discovering fire had on the lives of cave people. On another note – YOC I don’t think the emoticons are working because the “cherry on top” to this insightful bulletin is that wavey penguin thing & it doesn’t seem to wanna work. Springbokke to lose by 15 plus. to kick possession away aimlessly. we have one mediocre game. too many deficiencies in our game to confidently say we will win. NZ have the players to take the opportunities handed to them and SA need to create a hell of a lot more of those to take advantage of so all in all I do not expect SA to win this weekend. I would be very surprised if our loose trio is nearly as effective in this game as they were against Oz. It will be very interesting to see how we perform if our pack has no dominance. You can also play our forwards tired. I still doubt whether our loose trio is fast enough should they be drained of energy. The best way to beat us is to play a very fast tempo game around the fringes and forcing those 8 big guys to make tackles. Alberts and Vermeulen is in theory just too big and slow to keep up with 80 minutes of high intensity rugby. Thats why Flo and Bismark will be on the deck slowing their ball down. NZ can only play quick rugga if we allow them to, but of course by not allowing them their quick tempo touch rugby campsbay kaal tieties moffie game, the boks are then being branded as stupid thick unenterprising one dimentional dutchmen who of course will win, but only because they were lucky and McCaw was out injured. Saturday won’t be a try fest, it will be slow muddy trench rugby like @ twickenham in winter, we will win with penalties, I believe, and then anNAAIhilate them @ Ellis park with plenty tries. How will this effect the game? Can suit the slow Bok loosies? I hope SA manages to bring it to NZ, I believe in order for us to beat them we have to give it horns, they expect us to play territory and force errors, we must keep ball in hand and attack them hell for leather. run at them like 15 antelope on the highveldt. That said, I still vote for the home team on this one. Must say, add JP Pietersen, Brussouw and FdP to this squad and it probably the best we have had in a very long time. Jaques Fourie, and a conditioned Francois Steyn, as well as Johan Goosen, I like it!! Win the collisions, and you win the match. The fairies in the backline get the glory, but victory is established in the rough stuff. Spoke to one of the coaches this morning. The team and management view this as the break-through test for the squad not only for 2013, but up to 2015. They are going to give it a real go. And that is why you continue to back losing teams. Cannot wait for this test, it’s going to be massive. I reckon the AB’s still have to be favourites, they are just such a complete team, but the Boks are really good and in with a chance this weekend. As aflyhalf that sparked many a good sweeping backline runs in my life, I can only say that I agree with Morne. No backline can ever truelly win a game if their forwards do not dominate at collision time and set pieces. You need the strong men to win the game. What effing nation’s side does not “give it a go” against NZ over there?????? Question is whether they’d win. Winning is the only thing. 2 most important positions in rugby! Dawie, I never said anything about giving a full go. Sheesh, I said the AB’s must still be favourites, but we are in with a real chance. You reading with your glasses on wrong way round again? Only the first paragraph was directed at you…. Can we please have another graph like against the Ausies, showing us how the ABs are better in most positions? It worked a charm last week. Haha dawie, sorry man, looks like I put on my glasses wrong way round. Thanks, hopefully it will have the same effect.